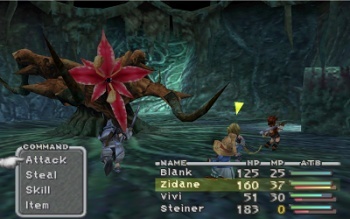 If you missed it back in 2000, legendary PS1 JRPG Final Fantasy IX will be hitting the PSN store next Tuesday, June 15th. In case you've been hiding under a rock, next week is E3: The biggest trade show of the year, and the week where everybody in our industry is looking forward. E3 shows what the future will bring, whether it's right around the corner (this season's games) or new technology like 3D gaming and motion control. But when we're all looking forward next week, why not take a moment to look backward? Say, back a decade to the year 2000, when Final Fantasy IX sang one hell of a swan song for the series' tenure on the original PlayStation? It was first mentioned back in April, and now it's confirmed: FF9 will hit the PSN for both PSP and PS3 owners next Tuesday, June 15th. If you really want to pick up one of the more fondly beloved entrants in the series, it'll run you $9.99 next week, which is a small price to pay for a game like this. So next week, when we're all looking forward, let's not forget to look back at where we've come from, all right?